A false-color image of Pluto paints the dwarf planet in an unusual light, highlighting the slight color differences between its different regions. Pluto's the prettiest dwarf planet at the party in this new, brilliantly colored image recently released by NASA. 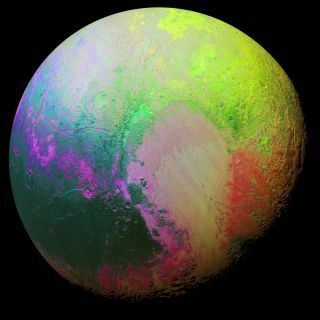 Researchers used a process called principal component analysis to create the false-colored photo of Pluto, which highlights the subtle color differences among the different regions, NASA officials said in a statement. The original image was captured by the Ralph/MVIC color camera on NASA's New Horizons spacecraft as it passed within about 22,000 miles (35,000 kilometers) from Pluto during its flyby in July. Pluto's geography has already proven astonishingly varied as New Horizons continues to send back detailed observations from its flyby. Flattened, icy plains; jagged ridges; deep craters; and even enormous mountains that are potential icy volcanoes all have been spotted on the dwarf planet. The New Horizons spacecraft just recently got in place to fly past the Kuiper Belt object 2014 MU69, a small, cold target more than a billion miles (1.6 billion km) outward from Pluto, a trip that will take an additional 3 years — and as it continues its long journey, scientists will keep poring over its Pluto flyby transmissions.